Master marksman Callum Wilson netted one of his finest goals for the Cherries to pave the way for their 2-0 win over Premier League rivals West Ham today. The striker raised the roof at Vitality Stadium when he scored with a stunning volley from 20 yards to break the deadlock eight minutes into the second half. And Joshua King capped a stirring second-half showing from Eddie Howe's team by killing off the Hammers with the Cherries' second in stoppage-time. It was a much-needed and hard-earned victory for the hosts which took them to the 30-point mark and saw them remain 12th in the Premier League. Chances were at a premium during a cagey first half with a header from David Brooks the closest either team came to scoring. And solid defending from the hosts ensured returning goalkeeper Artur Boruc would not have a save to make in the opening period. The Cherries took the lead when Wilson beat all ends up Hammers goalkeeper Lukasz Fabianski with a thunderous strike eight minutes after the restart. It was the striker’s 12th goal for club and country this season and his sixth in as many Premier League games against West Ham. And King registered his sixth of the campaign when he finished a good move involving Brooks and Junior Stanislas to bring up the Cherries' first win of 2019. Boruc was drafted in for his first Premier League game since lining up in the Cherries’ 2-1 win at Burnley in May 2017. The Pole, who made his 450th career appearance, was one of two changes to the Cherries starting line-up with striker Wilson declared fit. Jefferson Lerma’s speculative effort flew well wide in the early stages before Brooks went close to opening the scoring in the eighth minute. The Cherries playmaker, who had started the move with a lofted pass to Wilson, arrived at the far post to head his team-mate’s hanging cross narrowly past the post. Lerma was on hand to clear his lines after Hammers target man Andy Carroll had nodded a centre from Felipe Anderson back into the danger zone. Carroll received a yellow card after poleaxing Ryan Fraser before the Cherries had an effort disallowed in the 21st minute. Nathan Ake timed his run to perfection to head Fraser’s delicate cross past Fabianski, only for assistant referee Adrian Holmes to have deemed Wilson had strayed offside. Adam Smith threw himself in front of Anderson to block the Brazilian’s piledriver before Samir Nasri’s snapshot flashed past the upright. In the 31st minute, supporters from both teams joined in a moving minute’s applause in memory of Cherries fan Jamie Bird who passed away on Sunday, aged 31. Some patient build-up play from the hosts ended with Smith firing high over the crossbar before Brooks charged down Mark Noble’s shot and Declan Rice blazed the follow up off target. Fabianski got down smartly to his right to scoop away Steve Cook’s header from Fraser’s 48th-minute free-kick before Ake fired the loose ball across the face of the goalmouth. Michail Antonio and Carroll both fluffed their lines with the goal at their mercy after a cross from the right by Noble had caused problems for the Cherries. 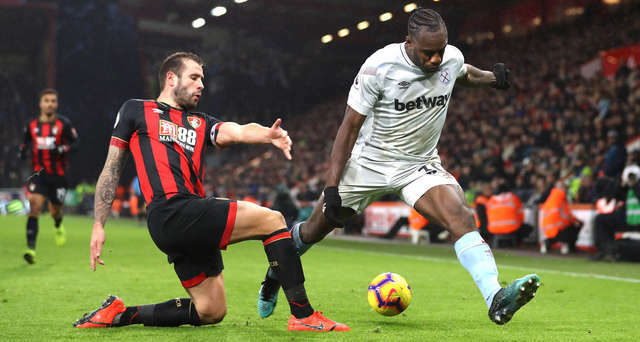 Firstly, Antonio, who could see the whites of Boruc’s eyes, missed his kick from five yards before Carroll contrived to sky his effort from two yards over the crossbar. The Hammers were made to pay when Wilson made the breakthrough eight minutes into the second half, despatching a stunning right-foot volley into the top corner from 20 yards. Fabianski was powerless to prevent the striker notching his 11th goal of the season for the Cherries, with Fraser superbly riding the challenge of Issa Diop to provide the assist. Lerma sliced his effort past the post after Fraser's cross had eventually found its way to him before Fabianski made a top-drawer save to push Wilson's first-time strike on to the post after he had fastened on to a low cross from Joshua King. The Cherries' appeals for a penalty fell on deaf ears after Brooks had gone down under an Angelo Ogbonna tackle before Boruc safely gathered Chicharito's 25-yarder. The Cherries doubled their lead in stoppage-time when King swept home from close range following excellent play between man of the match Brooks and substitute Junior Stanislas. Callum Wilson maintained his impressive record of scoring against the Hammers with undoubtedly one of his best strikes since joining the club. His classy finish, a venomous but precise volley from the edge of the box, showed just why he has earned international recognition this season. David Brooks produced another impressive display, the gifted midfielder’s intelligent use of the ball opening up the Hammers defence on several occasions. Unaffected by an early miss, when he headed wide from a good position, the 20-year-old deservedly went on to claim the man-of-the-match plaudits.